They are summaries of direct answers to specific questions people might have. Google Snippets are extracted from a web page by Google. They contain a link to the page, the page title, an URL and usually a picture. 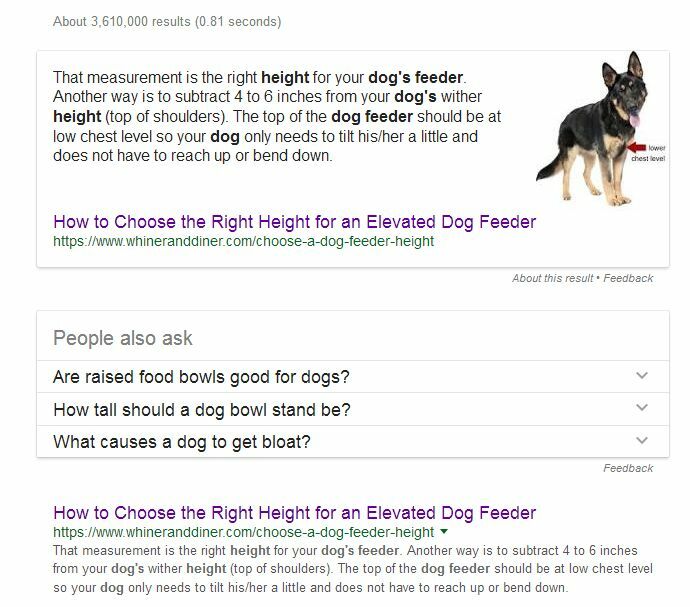 A featured snippet might look like the one on the right: Whiner and Diner, the pet business featured here sells elevated dog feeders and is a client of ours. While analyzing the website’s traffic, we noticed that many people were directed to a specific page. The page content explains “how to measure your dog for an elevated dog feeder” and “what is the best height for an elevated dog feeder”. The visitors directed to that page were searching for exactly that. We optimized the page even more for such queries. Google noticed, picked up the most relevant text and image. You can see the page title and URL right under the snippet. And as a huge bonus there is also a listing right under the answer box (“people also ask” section). Talk about prime cyber real estate!! 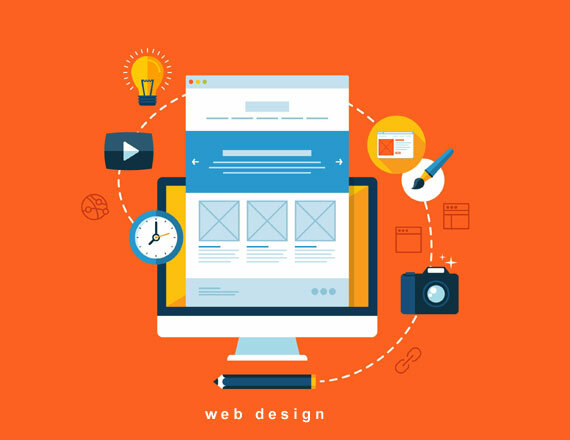 This is a great way to drive organic traffic to the website. How do I get a featured Snippet for my website? The demand for relevancy has greatly increased over the past few years. This is largely due to the ever-growing usage of mobile devices. People are getting more demanding and want the right information and they want it now. If your content is not relevant and does not answer the user’s question, you website will not be a good candidate for featured snippets. Note that Google extracts snippets from pages that already rank on Google first page of results, for that specific query. 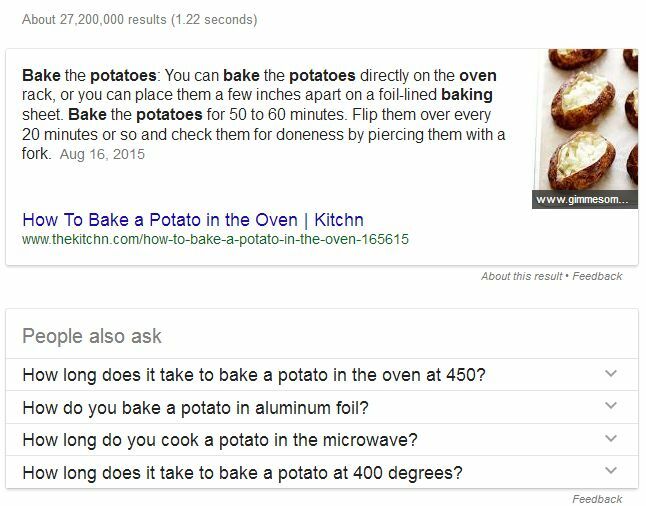 Example above: “how to bake a potato”. Look at the snippet formatting and content when searching for an answer to any questions. Is the snippet in the form of a list with numbers, bullet points? Notice the bolted terms. And just do the same. Will people still click on my site’s link after reading the Snippet? The trick is not to give the entire answer to the question in your snippet. Make it so people still need to visit your website to get the full information. People love featured snippets. They get a quick answer to their question without (most of the time) having to research anything and/or visit a website or app. So give it a try or contact us if you need any help with it. It’s a great opportunity to get free prime organic web traffic. But be aware that featured snippets can show up in search results one day and disappear next day. That’s the nature of Google’s game!